The geography of King of the Hill is a little wonky, but I believe it takes place within a 60-mile radius of where I grew up. KOTH co-creator Mike Judge has said in interviews he based the Hill family’s hometown of Arlen on Garland and Richardson, Texas—two Dallas suburbs. Since I also grew up in the area, many of the jokes and situations are extremely familiar to me. For instance, one of the characters, Luanne Platter (voiced by the late Brittany Murphy), shares a name of the combo plate I’d often ordered at beloved Texas chain Luby’s Cafeteria—the LuAnn Platter. Then there are all the male rites of passage revolving around preparing meat. And of course, their religious reverence to high school football. It’s all quite literally close to home for me. And I turn to the show when I miss the place. Portrayed as ignorant rather than malicious, the white characters regard the Asian Americans as exotic, foreign and inferior. Peggy Hill is delighted with the newcomers because, “It’s like we get to travel to the Orient without having to worry about getting diarrhea or being jailed for our pro-democracy beliefs.” Calling them “by nature, shy and reserved,” she invites the Souphanousinphones to dinner where she greets them with halting English and welcomes them to the country. Scenes throughout the episode undermine the Hills’ unwitting prejudices by demonstrating how like them (and therefore ‘American’), their neighbours really are. I felt a little like Bobby—an un-athletic, overly earnest aspiring prop comic. Around Bobby’s age, I was comically bad at sports and wanted to be a magician, then spent the rest of my formative years doing theater. I tried and failed miserably at football, then ended up on the pep squad, doing stunts and skits with the cheerleaders. 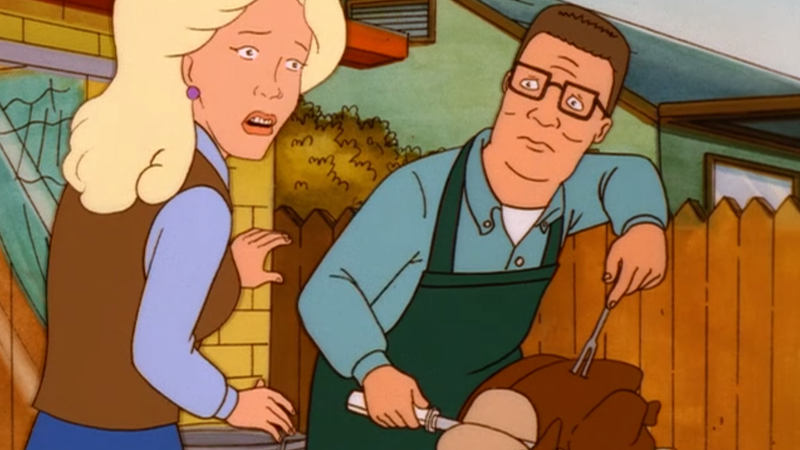 Fortunately, my dad was much more understanding and supportive than Hank, but I still felt misunderstood in the conservative Texas communities where I grew up. I still love returning to those communities. I just prefer to spend more time there over the Christmas holiday rather than Thanksgiving. Especially lately, as Thanksgiving tends to lend itself to political conversations I’d prefer to avoid. But I still miss Texas. Especially on days when I know a lot of my friends and family are returning to it. And whenever I miss Texas the most, I watch KOTH. It was a ritual I picked up when I was going to college in Kansas and it was often on Adult Swim. I recently found out I’m not the only one who sees the Hills as an occasional surrogate family. I learned Cranz also turns to KOTH when she’s homesick because we both had the exact same reaction when an editor posted in the Gizmodo slack channel that Hulu acquired the streaming rights for all 13 seasons of KOTH. I remember especially enjoying “Ms. Wakefield,” about an old woman who spends the holiday with the Hills because they live in her childhood home.